This is the festive salad of your dreams! 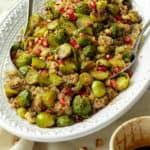 Maple roasted brussel sprouts tossed with nutty quinoa, fresh apple, crunchy toasted hazelnuts and tangy pomegranate all liberally drizzled with a sticky balsamic reduction. The most perfect pretty lunch. Vegan, GF & healthy! Place your brussel sprouts on a lined baking tray and drizzle with the oil, maple syrup and a large pinch of salt and pepper. Give everything a mix then place in the oven to roast for 20-25 minutes turning once half-way through until the sprouts are golden brown and tender. Meanwhile pour your quinoa into a medium saucepan and cover with 250ml water and a pinch of salt. Bring the pan to a boil before reducing the heat to a simmer. Your quinoa is ready to be removed from the heat once all the water has been absorbed (around 10-15 minutes). Just before serving heat a frying pan over a medium heat and add the hazelnuts. Dry fry them for 3-4 minutes shaking regularly until golden brown, then give them a rough chop. To serve, toss together the sprouts, quinoa, grated apple as well as half the hazelnuts and pomegranate seeds. Transfer to a serving dish or divide between plates and top with the remaining nuts and seeds. Drizzle liberally with the balsamic reduction and serve. This salad is perfect warm or cold. To serve cold, allow each component to cool completely before combining together and storing in the fridge. Any leftovers can be kept for up to 3 days in the fridge and are perfect for lunch boxes! Make sure your maple syrup is 100% maple syrup and not maple 'flavoured' syrup. You could also use honey if you prefer. If you can find it, try to use raw honey as it is less processed. If you aren't a fan of quinoa, rice, couscous (not GF) or bulgar wheat (not GF) would also work well.